Today was Sage's 9 month appointment. Can you believe it? Nine months. Those 9 months that I was pregnant seemed like they lasted forever and went by so quickly at the same time. 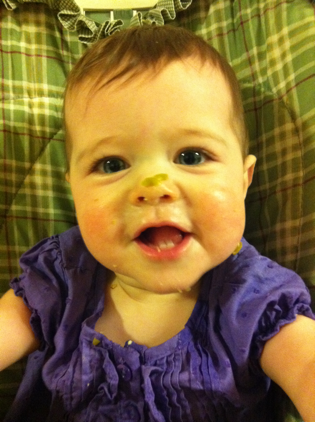 Now here my little one is, 9 months old, and it seems like just yesterday she was barely born and so dependent on me. Now she crawls all over the freaking house getting into crinkled leaves, pulling the kitty tails, and trying to chew on cords. So much more than I ever could have imagined. And I'm so grateful to her for teaching me new firsts. She made me a mother for the first time. And she taught me what it was like to love someone so much more than myself. She'll be the first to introduce me to kindergarten, and the first to introduce me to teenager-Dom and the first to introduce me to dating. I'm so looking forward to those days but relishing these sweet moments when I can kiss her whenever I want and always get one in return. And when I don't have to listen to her talking back to me. This girl is going to be an independent spit-fire. I can already tell. Oh my gosh I love this picture of Sage! She is starting to look like such a big girl!! She is no infant anymore. . . :( She is DARLING! Post more picture when you can! !